Webkinz are just so irresistible! Have some fun with these two exclusive Webkinz printable activities – perfect for a Webkinz birthday party or anyday! Help the Webkinz rescue their friend the Yorkie in this printable maze activity! 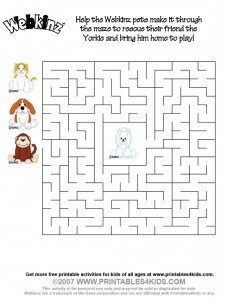 Click on the image above to view and print the Webkinz maze full size or download the printable Webkinz maze activity as a PDF file. A gust of wind has picked up all the Webkinz friends and left them scrambled. Unscramble all their names to see who is who. 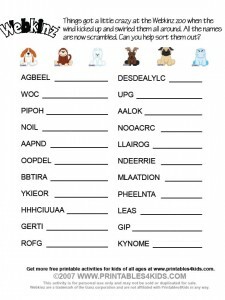 Click on the image above to view and print the Webkinz Word Scramble full size or download the printable Webkinz word scramble as a PDF file. 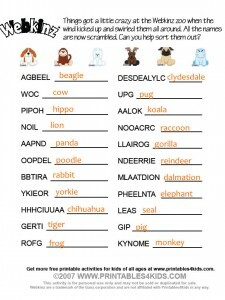 Need the answer key to the Webkinz word scramble? Click on the image below to view them. lol this site is funny!!!!!!!!!!!! This site is so cool… my brother loves it!!! i luv webkinz! webkinz rox! i love print this stuff for my kids they just love it!